In celebration of our 600th episode, we’re doing a Q&A session where I’m answering some questions posted on our Facebook group, The Sales Evangelizers, and I’m sharing with you a lot of great stuff about sales, about this podcast, and about me. Q: What did you know now that didn’t know then and thought you knew then but totally changed your view since? A: First of all, I didn’t know this podcast was going to keep going for this long and actually leave my day job and do this full-time. I didn’t know this podcast was going to bring me business and people are going to reach out to me for coaching, training, and speaking opportunities. I didn’t know I was going to outsource to get to the next level but I quickly learned that’s what I needed to do for it to grow. I thought I knew how to run a business then and thought I knew the things I needed to learn I can just learn and keep going. But I realized you have to treat the business as a business like taxes that need to be taken care of and that we need to do our books properly, HR things, and making sure team members are getting paid. I had to make sure I had to put processes in place or SOPs (Standard Operating Procedures) and learn from other people in business to make sure it thrives. So this went from just a hobby into a lifestyle business. Q: What’s hot in social media? A: Videos. You’ve got to have videos. Utilize different things like Instagram stories or Snapchat depending on your audience. The idea of sharing stories has become really big. Personally, I love Instagram. Another is the use of bots. Click on the Facebook Messenger button on the right-hand side of this page and you will get a chance to connect with us through messenger and interact with the bot Evangelist that will ask you questions and interact with you. Q: What are your upcoming big dreams and how are you planning to do them? A: One of my big dreams is to turn this podcast into the premier organization for new and struggling salespeople. I want them to find me. I want an entrepreneur starting a sales team and needs help. We also want to bring on another consultant on TSE who can go on-site to a client and deliver a training internally. I can see the vision of hundreds and thousands of certified Sales Evangelist trainers. I want our organization to be known as a place for new and struggling salespeople, whether you just finished college and want to learn sales or you’re doing a career change or have been selling but haven’t just been making money. I want to start that hiring process and by next year, bring that person on as one of our consultants. Q: How has podcasting helped your business or how is it helping your business right now? A: Podcasting brought the business into existence. Initially, I was just sharing with people things that worked for me and then interviewed guests and experts. Then people started asking me if I could do coaching and then came speaking and training opportunities. Things just came as a natural byproduct so the podcast is a fuel for the business. It’s a great way of getting in front of your audience and bring your message and expertise. Q: How do you decide on what content to produce for your audience? 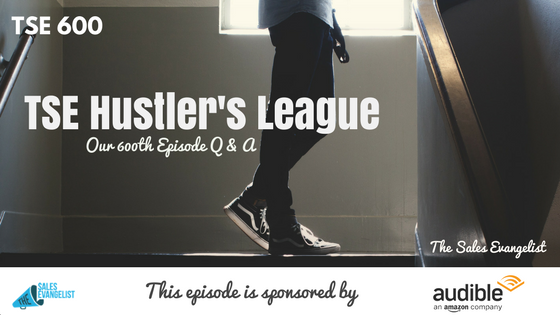 A: I usually like to let the audience help me out with this that’s why sometimes we ask questions in TSE Hustler’s League, our Facebook group, or sometimes people will ask questions and then that I will get an idea that it’s a topic a person is struggling with, let’s do an episode on that. Q: Why did you choose to podcast as a channel for your content? A: I thought I didn’t look good enough for a video and because it’s easier than video. It was new. And I’m a speaker so I figured it’s easier to speak on the mic. I’m a big fan of Pat Flynn and Seth Godin and my buddy Jared Easley persuaded me to continue going down that path. What keeps me going is the fact that it’s totally fun! The community is a very big plus for me. Second, I have a passion for selling and sharing my learning with people. Q: How do you manage to keep getting new people on your podcast and ensure that they will make your episode interesting, I assume you want to have good content? A: I want to have good content because it helps people and when it does, people share the content and then the community grows and opportunities come to us. It’s a cycle. You have to produce good content. The moment you stop producing good content, people will go elsewhere. I get emails from people wanting to guest on the podcast and when I get them, I look for topics that tie into sales and business, even if it’s not directly about sales but I can see it’s something I can apply to my business. I look for stuff that’s going to be beneficial for salespeople. Q: What’s your morning routine and how does it help you to get motivated for the rest of the day? A: I get up, do my morning prayer, and study my scriptures in the morning. Then I do an Instagram post. Next, I exercise. Then take advantage of opportunities to start doing some creative content I need to do be it writing or producing a podcast episode. Then study a sales book or an industry-related book through podcast or listening to an audiobook. Lastly, I eat right. Q: What is it really like to be Donald Kelly? A: My wife and I have been married for four years and still in the young stage. Cristina, my wife, is helping us out with The Sales Evangelist, particularly doing the marketing stuff and doing things in the background. I’m a member of the Latter-day Saints and at 32 years old, I am the leader of this congregation of about 140 active members and I’m responsible for their spiritual being. We have a youth ministry and I teach a bible study class. I basically do about 20 hours a week of service and then I have the TSE. Friday night is date night so I don’t do any work. Monday nights are family nights so we get together with family. o family and faith are big for me. I also love flag football. I love barbecuing. And I love sales. That’s the real Donald Kelly! Q: How do you select who to interview? A: I select people who can bring education or knowledge around sales to our community and people that can offer value. Q: How did that persevere for so long? 600 is an achievement! A: It’s something I love. I love talking so it just became a part of my life. The podcast is just something I love and then the business just starts to evolve each and every time. Q: What are your favorite type of guests? A: My favorite type of guests are people who I can just chat with and have fun with. They are people I have instant interaction with. Some of my favorite episodes are with Justin Su’a, Ralph Quintero, Jeffrey Gitomer, Patricia Fripp. It’s hard to label but I learned a lot from each and every one of them. Not one favorite in particular but I just love the opportunity to learn from each and every one of our guests but I had people I’ve built strong relationships with after the podcast. Q: What is the best piece of advice you have implemented from your guests? A: To make sure you create SOP’s (Standard Operating Procedures) shared by Ace Chapman. It helped me with by business overall. You’ve got to have processes. When Ace said it, I implemented it even more. Q: What do you want your next 100 episodes to be like? Q: What topic was not covered in your 600 episodes? A: I think we’ve covered almost every aspect of selling. We’ve tagged all our episodes. We have a drop-down feature here where you could search and see all of the different pieces of content we’ve tagged. Q: What tools do you use to best manage your territory and time? A: My Google calendar is key. One concept I’ve learned from one of our guests is to break down your day up to 15-minute chunks so you can tackle different aspects of your life as well as to make sure you plan. For CRM, we use Pipedrive internally to help me manage deals and those I oversee within my territory. Q: What has been gratifying to you in presenting these 600 podcasts? A: When somebody comes back telling me they closed a deal or they landed an opportunity or a job or they earned an x number of dollars because they implemented something that we taught. That is the most gratifying! Q: How have you changed? A: I became much better at communicating. I learned to communicate with a wide variety of guests, sharing complex topics, and answering questions. It has helped me with my sales as well. Q: What made you want to go into sales? A: It’s just a part of my lifestyle. I was just doing it since I was a kid and then later on people tell me I have a great personality for sales so I listened to them. But it wasn’t easy. I had to learn a lot of things and that’s what I did. Q: I want The Sales Evangelist origin story? A: I was new to sales and really wanted to learn and I was struggling. I went through a sales training program and saw some success and I was making money. I started seeing it was easy to sell if you applied the fundamentals and the processes. So I started to share that information with our community and then the podcast grew from there. Q: What have you learned over the past 600 episodes? Biggest surprise? A: The biggest surprise is that people cared about our show and people from all over the world actually listen to our show. People would reach out to me from Australia or a Middle Eastern country, from Europe, and Tokyo. It’s just amazing! It’s surprising for people to find our podcast and would take the time to listen to is and then would reach out to me and tell me how much that podcast has helped them. Q: What does staying in curiosity mean to you and how do we do this genuinely? A: Staying in curiosity means you’re always willing to learn, to grow, and to increase especially if you’re dealing with prospects. When you’re genuinely curious about individuals and their stories and you find out what moves them, when you ask those questions, you cannot help but stay curious. You cannot help but learn. Ask people deep questions and you will be amazed how many people share with you really interesting things about them.